This past weekend was able to spend some time with Alyssa and Heath Padgett. The Padgetts are a young newly married couple that are travelling through all fifty states - in a cool and inventive way. Heath and Alyssa were Married in May 2014, and decided to plan a unique honeymoon. - a roadtrip across all of the United States. Being a young couple, they dreamed how to fund such a trip. And came up with an awesome idea - and it took one email that made the dream into reality. Heath contacted snagajob.com looking for help in their idea - pitching the possibility of helping them find and work an hourly job in each of the fifty states, and film a documentary. Each job Heath would work, while Alyssa filmed and documented. Along the way they would write and film about the people, the jobs, and experiences they encountered. Snagajob.com liked the idea and the Padgett's enthusiasm so much that they offered to not just help find work in each state - but help fund their trip, while writing about it for Snagajob. Hourly America was born! The Padgetts purchased a "well loved" 1994 Coachmen Class C motorhome, and rehabbed the Twenty-year old beauty into their home and office on wheels..
How our paths crossed was through divine providence. Reading about "full-timers" - people traveling in RVs and living on the road - is how I sometimes like to relax and dream about the future. I first read about this adventurous couple in a website I follow - Gone with the Wynns - another young couple that are travelling North America in a motorhome. The Wynns include interviews with other travelers and how they make a living while on the road. As I read about Heath and Alyssa, I became really intrigued and inspired by them - setting off less than a week after their wedding in an older RV to see the United States. I noticed they were making their way east, and that they hoped to find a job in Philadelphia. Here was an inspiring couple coming my way - and I knew just where they could spend a few nights safely and at no cost in Philly! Since I'm not a Facebook fan, I reached out to Alyssa (couldn't locate Heath's email) and made a pitch of my own. Roxborough Presbyterian could be a Philly homebase, a place to "plug in" for electric, good WiFi, grab a Philly cheesesteak, a tour guide (me) if needed, and a home-cooked meal. Alyssa returned the email within hours with an enthusiastic YES! We emailed back and forth with logistics during the early part of October. I verified with leadership at RPC that their stay was possible. Meanwhile the Hourly America story really took wing during their stay in New York City. Up to this point they had a few blogs and local news stories, but once in the Big Apple, the media really wanted to hear about the Hourly America honeymooning couple from Texas. Interviews with CNN, Huffington Post, Fox Morning and more keep them busy for a few extra days in the New York City area. Heath and Alyssa made it to Roxborough Presbyterian for services on Sunday October 26th. After a short welcome time after the service, we got them situated in a location they could get power and WiFi. The media whirlwind tour in New York, and a fast-paced job at a burger place in New Jersey left them needing to slow down and catch their breath a bit. So though I was ready to "get-up and go" and show them the awesome sights of "The City of Brotherly Love" I could see they just needed to "recreate" together a bit. So rather than a quick tour of downtown Philly, we had a time to offer homespun hospitality. We tried to let the Padgetts rest for Sunday afternoon, with a later simple homecooked meal with our family. 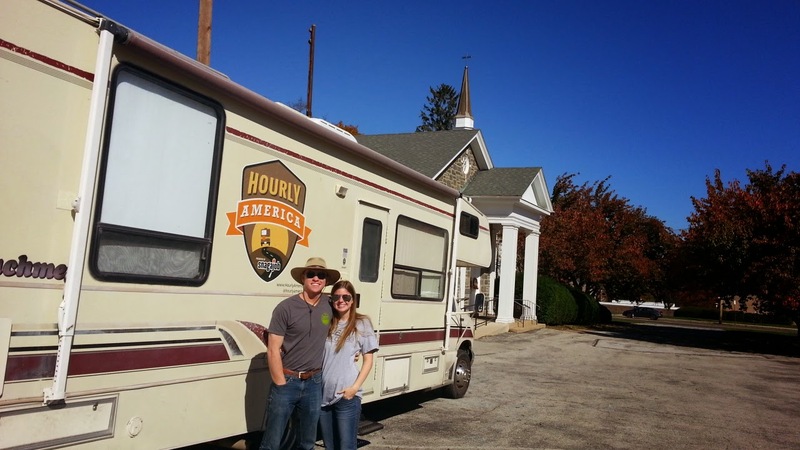 Late in the afternoon, Pastor Garcia and family had fun talking while touring Franklin, the Hourly America motorhome. Sunday evening Heath wandered over for a "fireside chat" at the Pastor's house to settle in the evening. Monday I had taken off from work, so it was nice to have a leisurely day for myself. I met up with Heath and Alyssa early afternoon. They both seemed energized, and we had time to sample two Philly-made treats. 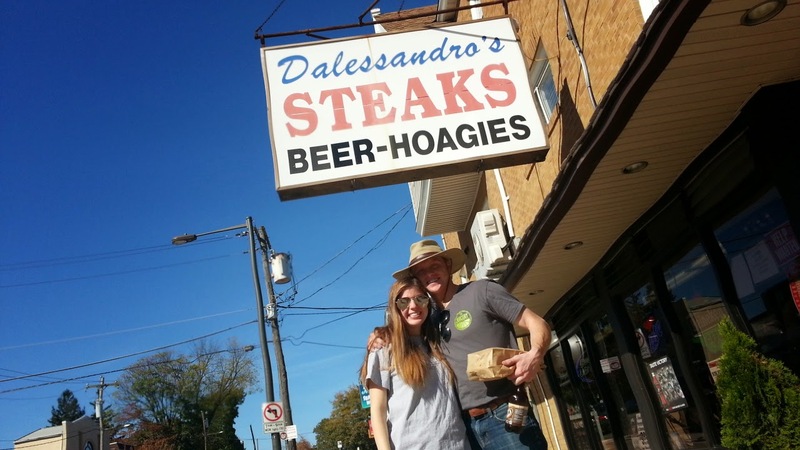 First a stop to Dalessando's for one of the best cheesesteaks in town. Then a trip to a local Rita's to taste a few flavors and try a gelati. After indulging, we took the "scenic route" through Main Street Manayunk, and I tried to explain about the gentrification and revitalization that has happened to the neighborhood. I left the couple off at Roxborough Presbyterian just in time to start Heath's Pennsylvania Job - working at the Fuel AfterSchool Program developed through the partnership between Roxborough Presbyterian and The Philadelphia Project. It was great fun meeting Heath and Alyssa. I hope that we afforded them not what we wanted to do, but what they needed after their hectic "media blitz" in New York. It was a blessing to meet them, and I hope the Roxborough Presbyterian family helped them to feel blessed by Billy Penn's city. Thanks to Pastor Ray, our families sent them off with prayers of peace and safe travels.